Hello. Thanks again to Jane Hambly for creating this amazing card using 'Swallowtail' in 'Tempting Turquoise'. I love the sponged background and the flowers make a sweet detail. The next cards I made to sell at our school gala a few weeks back. 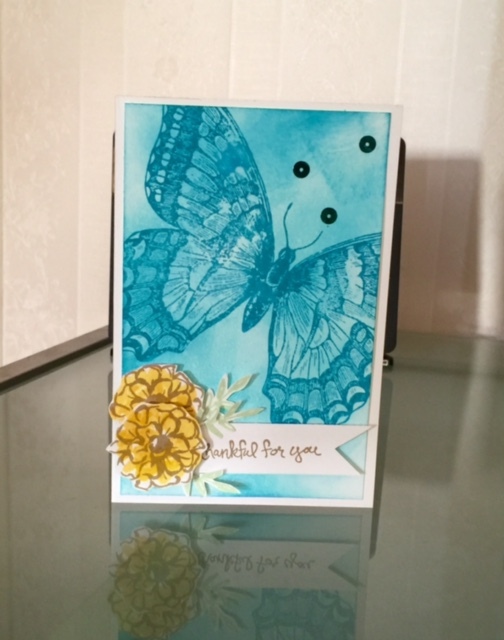 I combined it with the stamp sets 'Butterfly Basics' and 'Petite Petals'. I just love 'Swallowtail' for it's size, detail and uniqueness. Have an awesome weekend! Sally. Wow what gorgeous cards! really love them! Nice stampset!